Another one of Fox Sports 1’s launch shows has been canceled. Following in the footsteps of Fox Soccer Daily and Fox Football Daily, Crowd Goes Wild has been axed, according to Richard Deitsch of Sports Illustrated. CGW has been a lightning rod for criticism in the eight-plus months it’s been on the air, although there were times that it was able to be one of the true, fun alternatives in FS1’s lineup. The show was never able to attract a solid base of viewers, and no one seemed drawn to it – either because there was too much Regis or not enough Regis. And really, that may be the most damning criticism of Crowd Goes Wild – they couldn’t please anyone because of the show’s initial marketing blitz around Philbin. 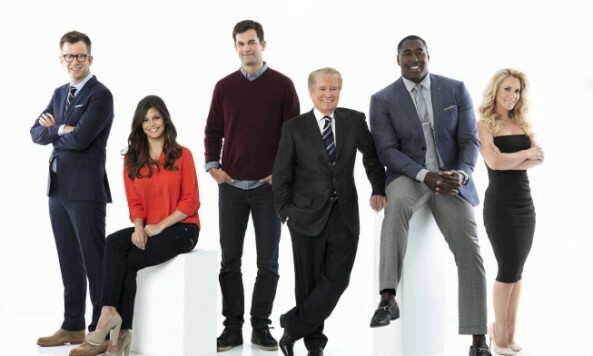 To replace the show, which will air a finale on May 8th, on their schedule, Fox Sports 1 is expanding their Mike Francesa simulcast to 5 PM, pushing NASCAR Race Hub back to a 5 PM start time, and will continue to air America’s Pregame at 6 PM. While that may end up being cheaper for FS1 in the long run, it probably won’t help too much in the ratings department – Francesa’s FS1 simulcast averaged just 18,500 viewers during the week ending April 20th, and America’s Pregame averaged only 12,000. That same week, the ridiculously strong lead-in of Race Hub bolstered CGW to an average of 35,500 viewers. The cancellation makes plenty of sense when you look at the bigger picture – the show was produced in New York (separate from Fox’s main studios in Los Angeles), it wasn’t exactly drawing in a huge amount of viewers, and it had no idea what it was. Was this still “the Regis show”? Was it a “fun” show that wasn’t meant to be taken seriously? I’d expect some of the names that starred on CGW to pop up on other FS1 properties, though I have no idea what the fit will be. Georgie Thompson, Katie Nolan, and Trevor Pryce were the show’s breakout stars, and I think all could end up in other prominent roles. I’m not sure if there’s much of a role anywhere for Jason Gay or Michael Kosta, though they had their moments on the show too. One wonders if CGW would have found more longterm success if they were the focus of the show from the beginning instead of being supporting cast members for Regis. I think the most damning thing about CGW’s cancellation is that FS1 has taken another step towards being just another ESPN clone instead of something different. Love or hate CGW, it was markedly different than anything you would ever see on any other sports network. The daily soccer show that no one watched is gone, and the host of that show is languishing at the network’s update desk. The daily football show with analysts that were actually interesting is gone, and its stable of talent has fallen off the map in the offseason. The much-maligned panel on Fox Sports Live is gone, replaced with more conventional analysis segments. And now, the daily comedy/Regis show is gone. In their place, we’ve gotten three (now four) hours per day of a local radio simulcast, and a pregame show that might have some potential. Adding an extra hour of the Mike Francesa simulcast almost seems to be giving up on some of the ambition that Fox Sports 1 showed before its August launch. The network is basically admitting that its original programming can’t draw an audience, so they’re going with a streamlined daily lineup. In closing, I present you with one of the few CGW moments that gained traction and buzz – Katie Nolan’s epic takedown of Rick Reilly.